100,000 marine mammals ingesting plastic. It’s time to say “no” to plastic straws. Connect with us. Share your story. Milo Cress is a boy from Burlington, VT, who wanted to reduce and possibly eliminate the use of plastic disposable straws in restaurants. 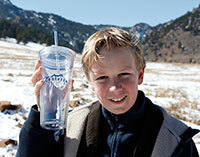 So in 2011, at the age of 9, he founded the Be Straw-Free project, which focuses on building awareness about plastic waste and its impact on the environment. Since then, Milo has visited local and international cities around the world, urging restaurant owners to adopt his “Offer First” policy, where straws would be offered first rather than being included automatically with served beverages.